Thanksgiving is supposed to be a time of family coming together in peace and thankfulness as they dine, watch football, and sleep off large amounts of consumed turkey. But in November of 1978, Shirley Tedesco has bitten off a bit more than she can chew when she decides that her family should spend the day with her wacky sister, Theresa. Theresa almost ruins Thanksgiving dinner when she screws up Shirley’s instructions regarding the turkey. To keep Joe from noticing the shenanigans taking place in the kitchen, Shirley sets Joe up with snacks in front of the TV. One of those snacks is the well-known cracker, Ritz. Ritz crackers have a humble history that began in 1801. John Bent, a retired sea captain, improved a recipe for hardtack biscuits (an English term used at that time) with the addition of leavening agents which produced a flat, crisp biscuit. The Bent family managed baking the new recipe while Bent traveled the countryside selling crackers from a wagon. The Kennedy Biscuit Works further refined the recipe by using sponge dough thus producing a lighter consistency. In 1898, Bent, Kennedy Biscuit Works, and many other bakeries united to form the National Biscuit Company. In 1934, the recipe was perfected which resulted in a smooth, flaky cracker with a light, buttery flavor. Unlike the pale, square crackers widely sold at the time, this new cracker was round, golden, and had serrated edges. The cracker received the name Ritz as a result of a company-wide naming contest. A legend exists that claims Ritzville, WA supplied the name of the cracker because the flour used in making them at the National Biscuit Company plant in Portland, OR came from Ritzville. This is pure fiction. Mass production of Ritz crackers began in Nabisco’s North Philadelphia bakery, and the new product was introduced to the market in Philadelphia and Baltimore on November 21, 1934. 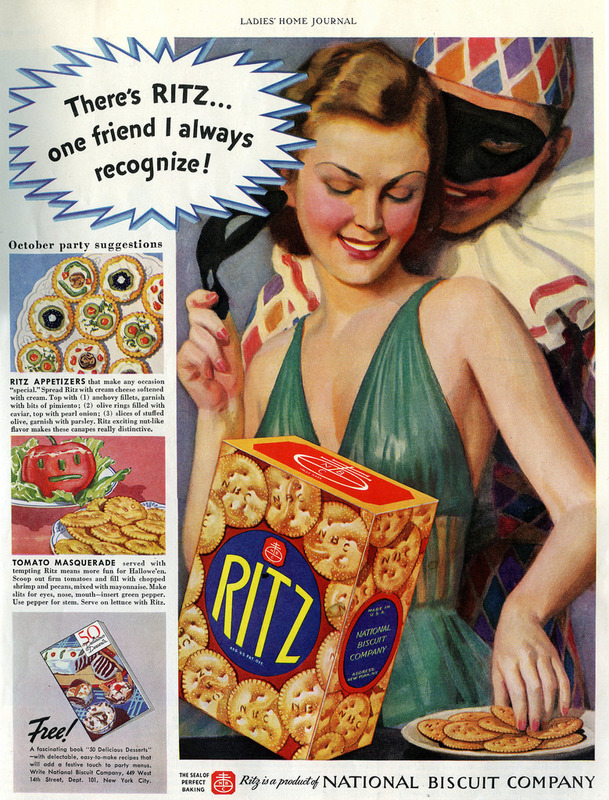 Thanks to brilliant marketing that promised a taste of luxury during the Depression years, Ritz sold in the five-billion volume area during its first year of nationwide distribution in 1935. Also adding to the popularity of the mass-produced cracker was the low price of nineteen cents a box, a marketing practice made possible since Nabisco was the only baking manufacture with facilities capable of nationwide distribution at the time. Sydney S. Stern, a Hungarian immigrant who turned personal tragedy into a prolific commercial art career, is responsible for the easily recognizable box of the world’s most famous cracker. Stern established himself as an independent commercial artist, but in 1928, after losing his wife to childbirth complications, Stern accepted a nine-to-four job with Nabisco to support his family. In one weekend, Stern, inspired by a circular label inside his hat, designed the blue circle with the word Ritz in yellow lettering. Although worried that Ritz crackers would rub Depression-era customers the wrong way, the tasty cracker and brilliant marketing had the opposite, positive effect. 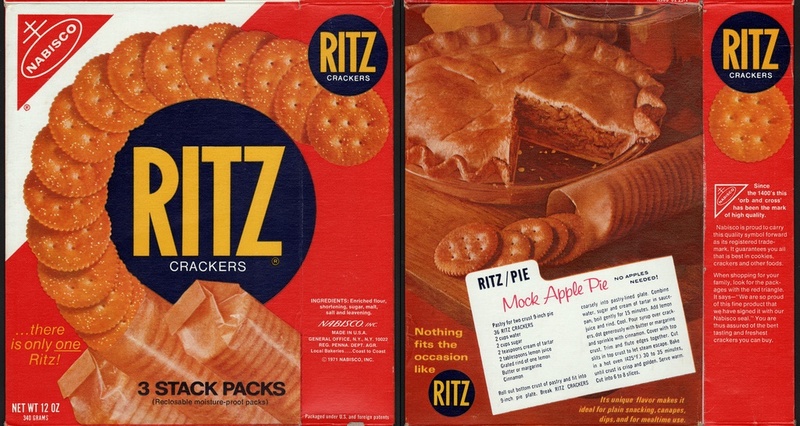 Flash forward to the 1970s and the Ritz commercials where Andy Griffith quips, “Everything tastes great when it sits on a Ritz.” Griffith’s affable nature, reinforced by his television persona Sheriff Taylor, made the perfect accompaniment for a posh-tasting cracker meant to satisfy common folk. The catchy tunes sung by the handsome actor were memorable enough to keep housewives reaching for the delicious crackers when choosing hors d’oeuvres ingredients. Unfortunately, Andy’s crooning wasn’t enough to keep Nabisco from adding high fructose corn syrup to the cracker recipe. 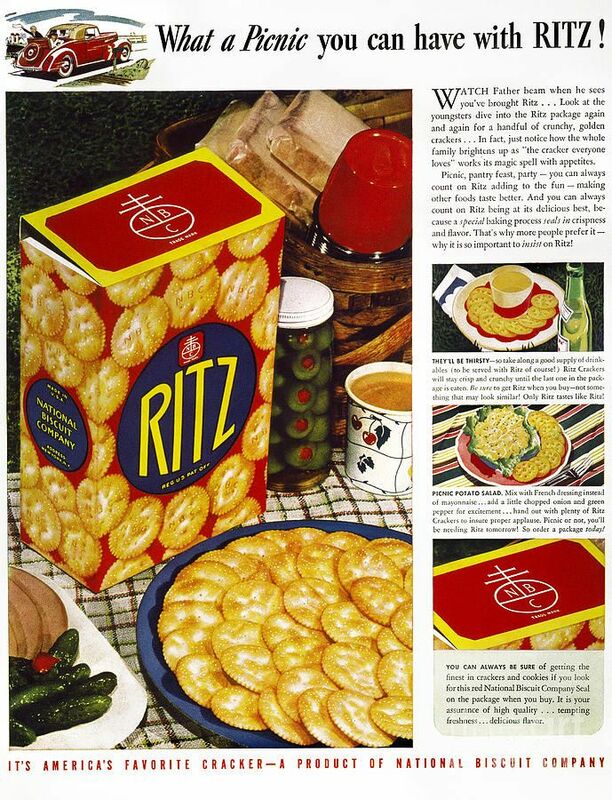 I am unable to discover exactly when this happened, but when added to the fact that there is absolutely no fiber in a Ritz, I’m afraid the beloved cracker has been reduced to yet another processed food that has been eliminated from the Gibson family cupboards.